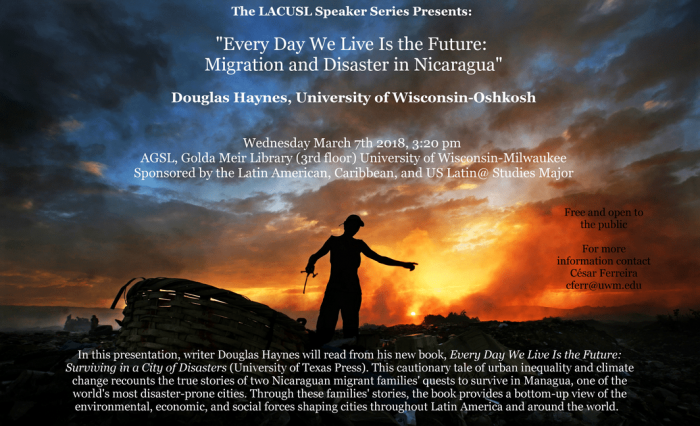 In this presentation, writer Douglas Haynes will read from his new book Every Day We Live Is the Future: Surviving in a City of Disasters (University of Texas Press). This cautionary tale of urban inequality and climate change recounts the true stories of two Nicaraguan migrant families’ quests to survive in Managua, one of the world’s most disaster-prone cities. Through these families’ stories, the book provides a bottom-up view of the environmental, economic, and social forces shaping cities throughout Latin America and around the world.